A new retrovirus, xenotropic murine leukaemia virus-related virus (XMRV), first identified in tumor tissue of individuals with prostate cancer, was subsequently found in 68 of 101 US patients with chronic fatigue syndrome (CFS). XMRV was not detected in blood samples of 186 confirmed CFS patients in the United Kingdom. A second independent study in the UK (pdf) has also failed to reveal XMRV in CFS patients. The subjects of this study were confirmed CFS patients from St George’s University of London, Barts and the London Hospital Trust, and Glasgow Caledonian University. A total of 170 serum samples from CFS patients and 395 controls were used. A polymerase chain reaction assay was devised that could detect as little as 16 copies of proviral XMRV DNA (viral DNA integrated into human chromosomal DNA). No XMRV sequences were detected in 142 CFS samples and 157 controls. A second method was then used to search for evidence of XMRV: the patient serum samples were examined for the presence of antibodies that could block infection of cells with the virus. Cells were infected with XMRV in the presence of serum from CFS patients or control patients. Included were sera known to block XMRV infection to ensure that the assay functioned normally. None of 142 CFS samples contained antibodies that could block XMRV infection of cells. In contrast, 22 samples out of 157 controls (14%) were identified that contained neutralizing activity. One of 28 CFS serum samples from a separate cohort was found to contain XMRV neutralizing activity; none of the 12 control sera could block XMRV infection. These results could be interpreted to mean that XMRV infection occurs in the general population, confirming the observations of the first US study. However, the sera from the second UK study also blocked the infectivity of viruses other than XMRV, including those containing envelope proteins from vesicular stomatitis virus. The authors believe that the neutralizing activity in the control sera is not specific for XMRV. These antibodies were probably induced by infection with another virus. The publication of these results has promoted much discussion and controversy amongst CFS researchers and patients alike, and has highlighted the need for additional investigations in this area. Following the findings reported here, it would seem a prudent next step for subsequent studies to compare samples and protocols between different laboratories around the world. It’s time to put aside arguments over the competence of laboratories to carry out polymerase chain reaction and work towards understanding the role of XMRV in human disease. The three laboratories who have published their findings on XMRV in humans should exchange their samples to confirm the findings. Compelling answers will only come from far more extensive global studies of the prevalence of XMRV in CFS and control populations are clearly needed. Looks like the methods for detecting XMRV are still far from perfect at the moment, in particular the PCR. It would be premature to draw any conclusions about prevalence from negative results at this point; absence of evidence is not evidence of absence. As noted, studies such as this and earlier studies are all important in leading to a better understanding of XMRV in specific as well as the role of viruses in disease. European scientists have also been unable to replicate XMRV findings in subgroupings of prostate cancer. As noted in a previous excellent blog entry here, 21st century scientists are tweaking traditional postulates such at those first stated by Koch in the 1800s. A number of viruses (in some subgroups reactivated latent viruses) EBV, HHV-6A, enteroviruses, and parvo viruses have all been associated with CFS or subgroups of patients, but not in all. One interpretation of the incomplete evidence is that viruses do not have a etiopathogenic role to play. Another is, as stated above, that CFS is triggered by many different viruses and/or maintained by reactivated viruses causing a cascade of biological abnormalities. Other scientists believe that CFS is actually an overly broad term covering a number of diseases and that overly broad definitions play a role in who is diagnosed (or misdiagnosed) with what. Much remains unanswered. Adequate funding for biological research and the ability to say “what if” and live with incomplete answers are two of many keys to knowledge in science – as is collaborative science. Thanks for your ongoing, evenhanded coverage of this topic. I agree that a simple exchange of samples would go a long way toward solving the uncertainty here – I hope the scientists involved will take your suggestion to heart. I hope my dr knows about this – she JUST sent me for additional blood work today! I used to be so active, retired 8 years ago and spent first 2 years in bed, forced myself to start getting up and spent some time up during the day about 20% max but still in bed, just awake. Then went to making myself get up, probably 5% of the day. Was doing well, until recently… back to not being up very long before I have to go back to bed…. This last fact and the already established relationship should facilitate the sharing of samples and methodology (and at the same time, it raises a few questions). very nicely thought out piece. Thanks for another excellent post on this. I'm currently putting together a quick overview of all the published studies on human XMRV: will post it on my blog as soon as it's done. The overall picture though (as is well known already) is that XMRV has never been detected from any British or European person, either in blood, or prostrate cells, using DNA PCR, RNA PCR, or any other method; there have now been >1000 British/European people tested (including CFS, prostrate cancer, and healthy people) and no evidence of XMRV in any of them. Ooops, sorry. XMRV has been detected in 2 German people, out of a total of about 1300 German, British and Irish people tested (CFS, prostrate cancer, healthy controls). This is still much lower than the rate seen in the USA. My summary of the data so far is here. According to some ME/CFS forums, there are a number of UK sufferers who have been told they are XMRV positive after sending their blood off to the US for testing. As a sufferer, I find this hard to ignore, particularly as the number of XMRV positives are increasing. I think we really need to see how the other studies pan out before we come to any conclusions. WPI news: “Perhaps the most important issue to focus on is the low level of XMRV in the blood. XMRV is present in such a small percentage of white blood cells that it is highly unlikely that either UK study’s PCR method could detect it using the methods described. Careful reading of the Science paper shows that increasing the amount of the virus by growing the white blood cells is usually required rather than using white blood cells directly purified from the body. When using PCR alone, the Science authors found that four samples needed to be taken at different times from the same patient in order for XMRV to be detected by PCR in freshly isolated white blood cells. More importantly, detection methods other than PCR showed that patients whose blood lacks sufficient amount of XMRV detectable by PCR are actually infected. This was proven by the isolation of viral proteins and the finding of infectious XMRV isolated from the indicator cell line LNCaP. The authors of the Retrovirology paper admit that their neutralization assay did not detect bacterially expressed XMRV gag and that positive control sera was needed to validate their assay. The WPI’s monoclonal antibodies specifically and sensitively completed the immune response demonstrating the assays sensitivity and specificity for XMRV envelope. Yeah, as Diesel notes above apparently the WPI thinks the key issue is the fact that WPI cultures their samples for 4-5 days to increase the amount of XMRV present prior to conducting PCR due to XMRV being present at such a low level. February 18, 2010: WPI is aware of the recent UK study that was unable to detect the presence of XMRV in any CFS patient samples. Although researchers at the WPI were not involved in this project, our work in XMRV continues with researchers around the world. We look forward to the results of studies which replicate the methods used in the original research described in the journal Science in October, 2009. 1. The authors of the Science paper established the existence of XMRV as an infectious human blood borne retrovirus for the first time in blood of patients diagnosed with Chronic Fatigue Syndrome (CFS). Previous studies had established the presence of XMRV sequences and protein in human prostate tissue. d) A specific antibody response to XMRV. 3. The authors of the two UK studies did not attempt to “replicate” the WPI study. Replication requires that the same technologies be employed. The WPI sent reagents and information to several groups of researchers in an effort to support their replication studies. Neither UK study requested positive control blood, plasma or nucleic acids from the WPI. 4. The collection, preparation and storage of DNA were completely different between the Science and UK papers. The latter studies do not show data on blood harvesting or storage. Nor do the studies disclose the quantity of isolated cells. Insufficient number of cells analyzed may result in failure to detect a low copy virus like XMRV, regardless of the sensitivity of the assay. Neither UK study provides detail to allow interpretation of how many white blood cells were analyzed. 5. Patient population selection may differ between studies. 6. The UK authors were unable to detect XMRV, even though 4% of healthy individuals were found to be infected in the US. Japanese scientists detected XMRV in 1.7% in healthy blood donors in Japan. The two previously identified human retroviruses have distinct geographical distributions. 7. Perhaps the most important issue to focus on is the low level of XMRV in the blood. XMRV is present in such a small percentage of white blood cells that it is highly unlikely that either UK study’s PCR method could detect it using the methods described. Careful reading of the Science paper shows that increasing the amount of the virus by growing the white blood cells is usually required rather than using white blood cells directly purified from the body. When using PCR alone, the Science authors found that four samples needed to be taken at different times from the same patient in order for XMRV to be detected by PCR in freshly isolated white blood cells. More importantly, detection methods other than PCR showed that patients whose blood lacks sufficient amount of XMRV detectable by PCR are actually infected. This was proven by the isolation of viral proteins and the finding of infectious XMRV isolated from the indicator cell line LNCaP. The authors of the Retrovirology paper admit that their neutralization assay did not detect bacterially expressed XMRV gag and that positive control sera was needed to validate their assay. 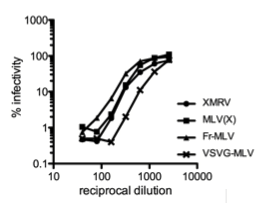 The WPI’s monoclonal antibodies specifically and sensitively completed the immune response demonstrating the assays sensitivity and specificity for XMRV envelope. Simply stated the only validated reliable methods for detecting XMRV in CFS patients, to date, are the methods described in Science. Failure to use these methods and validated reagents has resulted in the failure to detect XMRV. A failure to detect XMRV is not the same as absence of this virus in patients with CFS. CFS patients from the UK have been testing via VIP labs and results are very similar to those reported by US patients. Currently 8/15 have tested positive (by culture) for XMRV. This is not a geographically isolated virus by any means, at least not as far as the UK/US is concerned. The differences in the published results are almost certainly down to methodology. So far only the methods used by WPI (& collaborators) appear to be able to find XMRV. The zero rate of detection in the 2 most recent studies is telling. One thing we have discovered is that PCR is not a very good way of finding this virus. Is my reading of the differences in controls and CFS patient blood samples correct in that it appears that all of the healthy control blood samples were “fresh” and all of the CFS samples were stored and ranged in age from 1.5 to 9 years old? This is the first study in the EU to find a background rate of infection in healthy controls resembling the 4% found in the US studies. Interesting that the study did not find the same 4% background rate in the CFS patients. Blood sample handling issues? Some of the WPI samples were much older than 9 years. Could there be differences in the amount of XMRV in fresh versus stored blood that accounts for these differences? I too find it rather odd that the UK people tested positive using the WPI approved XMRV tests. I believe that the UK labs are not following the WPI protocols as strictly as they should be doing. Thank you for your updates and insightful articles on viral diseases and particularly XMRV and CFIDS/ME. It is much appreciated. It's time to start sharing samples and methodology. Lots of work moving forward to answer some key questions. Transmission of XMRV in non-human primates has been demonstrated with the virus subsequently found in reproductive and lymphatic (? – not clear on tape) tissue. Thanks for your blog. One question I have about the antibody part of the study: why is it that only one CFS subject has any positive antibody? If these antibodies are non-specific and the assumption is that the CFS group comes from a similar environment as the controls, then shouldn't more CFS subjects have antibodies? Sorry about the spacing issue in my recent post. Can the original error be fixed and this post deleted by the administrator? Several new abstracts from the recent CROI meeting in San Fran. These studies(this study?) showed that XMRV was indeed present “in the absence of detectable plasma viremia”. It would help a great deal if when discussing XMRV you could make clear that both UK studies did not replicate the study by Lombardi et al that found an association between XMRV and CFS. Scientist seem to think that they can do their own thing – not worry about replicating the original findings and then come up with an outcome that does not match and then claim that there is no association. Lombardi et al didn't just use PCR – they used four different techniques over 3 Centres of excellence that took 2 and a half years. Quick “n” Dirty non replication research that does not copy the original methods including the way patients are selected (neither UK study chose their patients to the same criteria as Lombardi et al chose theirs – seems to be an example of exceedingly poor science in action. It's a shame scientist don't seem to care about the exactitude of their work these days. Have you all seen the british medical journal this week? More vaccine contamination. Be sure to read about XMRV and autism. Research HIV and SV40 monkey viruses and vaccines. unfortunately my friend Jonathan Kerr was not awarded tenure in London and had to give up his excellent CFS research. We sent him 120 specimens for the XMRV experiment, not all were tested.